What’s happening folks – a belated happy 2019 to everyone! We made it y’all, and we can look forward to incredible new music this year. 2019 also marks the twentieth anniversary of a number of unforgettable albums, and this is where we come in. In 1999, as we approached a new millennium, artists such as DMX, Snoop Dogg, The Roots, Nas, and Jay-Z were delivering tremendous music for our ears, as did new artists such as MF DOOM, Pharoahe Monch (as a solo artist), Mos Def – and some bleached blonde, blue-eyed phenom from Detroit made his debut as well. 1999 was a memorable year, and this article we will salute a duo who’s penchant for vivid rhymes of street lore and visceral production made them be among the most in-demand duos in all of Hip Hop. Their ’95 effort The Infamous will forever be regarded as a Hip Hop monument and a tried and true classic. The follow-up, Hell On Earth, was even more macabre and even more venomous. 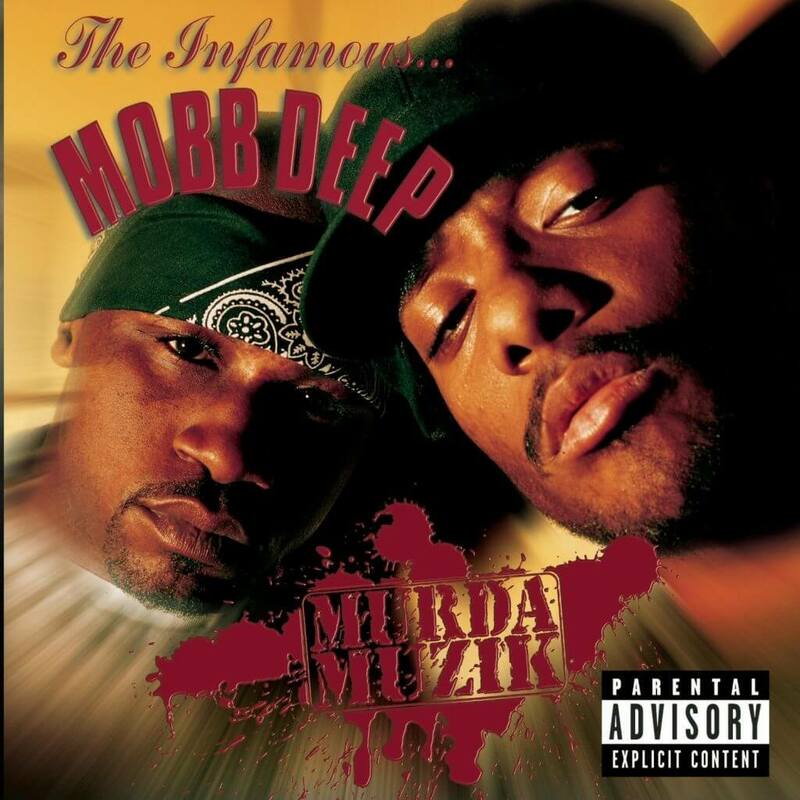 With two near platinum albums on deck, and their name consistently bubbling in the streets as well as in the mainstream, it was only a matter of time before they hit that one million in sales – they just needed the album to accomplish it: this salute goes to the legendary, but Infamous, Mobb Deep and their fourth album, Murda Muzik. It had been three years since they dropped the simply awesome Hell On Earth album, and with Havoc getting more and more production duties on various efforts and the late, great Prodigy KILLING guest spots all over the place, the anticipation was mounting. Finally the announcement was made that Murda Muzik was coming, and the streets were nuts with in anticipation of a new Hav and P effort. Would they go three for three in terms of classics? All it took was one hit of “Quiet Storm” to answer that question. Over a sampling of “White Lines” by Grandmaster Flash & The Furious Five, P ripped a hole in this cut with Hav providing the anthemic hook. If that wasn’t enough, they dropped a remix with new verses from P, Hav and a guest spot from Lil’ Kim (I challenge anybody to tell me P didn’t have a verse of the year candidate with his sixteen). The anticipation was so hot, the bootleggers went bananas with it and leaked the original pressing to the streets. While discouraging, P and Hav took some cuts off such as “Nobody Likes Me”, the P solo cut “Pile Raps”, the Onyx-collab “QB Meets South Suicide”, “Perfect Plot” and “Thrill Me”, and added cuts like the second single, the Scarface-sampled collab with Nas, “It’s Mine”, “Spread Love”, and “Can’t F*** Wit” with Raekwon. If you have the original pressing, consider yourself fortunate – but the new tracks were fire too, as they still kept the hard-nosed gun raps that help emphasize the Mobb’s notorious artistic aura. Following the intro, we got the melodic “Streets Raised Me”. From there cuts like “I’m Going Out” with Lil’ Cease and the Cormega-assisted “What’s Your Poison” sounded like a slightly new direction for the Mobb, albeit still dope. The haunting and classic Mobb cut “Allustrious”, complete with a chilling organ loop and enough thump to make your neck cramp, as well the following cut, “Adrenaline”, which was equally as ferocious. By mid-album, you realized they did it again. Other cuts like the title track, “Thug Muzik” and the blistering Kool G. Rap-assisted “The Realest” were consistent rotators and perfectly fitting for an album of this magnitude. We even got a bit of vulnerability from the otherwise hard-a** Hav and P with “Where Ya Heart At” (especially from Hav in his dedication to his late brother Killa Black). Murda Muzik was another example of how remarkable of a duo these two QB kids were in the late nineties. This album was not only another insane release from them, this marked their first platinum effort. While the original pressing was possibly even better, the released version was super strong and excellently showed the chemistry that Hav and P naturally had. 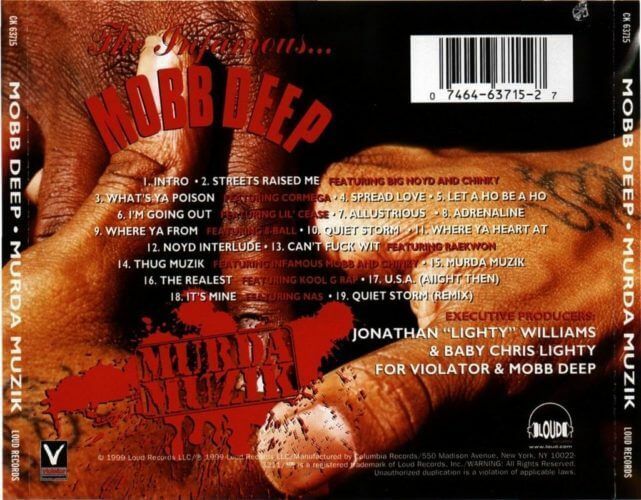 In much the same respects as the likes of EPMD, Mobb Deep hit legendary status with this monster of an album, and once and for all shut down any talk of any concerns of a fall off. While subsequent albums such as Infamy, Amerika’z Nightmare and Blood Money didn’t quite live up to the Mobb standard we came to expect from them, The Infamous Mobb Deep showed a return to what we had known from them. That said, this 1999 album was a certifiably head-cracker. We salute the god Bandana P (rest in power man) and the mighty Havoc for this epic piece of music. Happy twentieth!